UNITED NATIONS, December 15 -- The UN under Ban Ki-moon and his political advisor B. Lynn Pascoe opened a regional center in Turkmenistan. Over the weekend, as an election was held in the country in which 90% of the candidates all came from one party, the UN had three people in Turkmenistan in connection with the election. All hail, Gurbanguli Berdymukhamedov! In response to a request from the Government of Turkmenistan, the United Nations deployed a small technical assessment mission with a view to report to the Secretary-General on the parliamentary elections on 14 December 2008. It was not there to observe the elections, not will it be making public statements on the conduct of the electoral process. So how can it be called an assessment mission? What did it assess, and for whom? What is the least quantum of democracy which the UN will use to justify putting a center in a state rich in natural gas? "Gulgeldy Annaniyazov was one of the dissident leaders known as the 'Ashgabat Eight.' He was imprisoned in 1995, after organizing a demonstration in support of democratic reform in Ashgabat. The severe conditions in Turkmen prisons took their toll on the prisoners. In 1998, a fellow prisoner reported that Annaniazov's condition had deteriorated dramatically, and he could barely walk or speak. One of his co-defendants, Charymurat Gurov, died in prison, apparently as a result of torture. Three men, presumed to be security service agents, entered his parent's home on 24 June 2008 and arrested him, without presenting a warrant or giving any reasons for his arrest. They refused to tell Annaniazov's family where he would be detained. 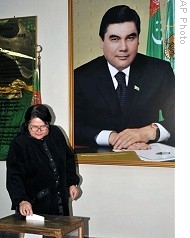 The arrest took place at the same time as the EU-Turkmenistan human rights dialogue was conducted."